The Syria-Lebanon border region between the Homs countryside and the north Beqaa came to some media attention last month when Russian military police arrived in the area. There was also some talk of an impending Hezbollah withdrawal. In fact, the Russian military police quickly departed, while the Hezbollah presence remained as it was before. The incident led to rumours that the Russians had sought for Hezbollah to withdraw from the area, only for Hezbollah to reject that, partly on the grounds that the Russian move into the area was not coordinated with the group and Iran. Whatever the case, there has been a notable change in the border areas. Specifically, the unofficial crossings that Lebanese citizens living on both sides of the border have been using are now closed. Of course, this development significantly disadvantages those Lebanese citizens who use those crossings. Example of an unofficial crossing that has now been closed. Notice that the path has now been blocked. To explore the issue of the border areas further, I did an interview with al-Hajj Muhammad Ja'afar, who leads Dir' al-Watan, a unit of the Russian-backed V Corps. al-Hajj Muhammad Ja'afar is originally from the north Beqaa town of al-Qasr on the border with Syria. His group has a base in the village of Zeita on the Syrian side of the border. The village has a Lebanese population and Russian personnel have visited the Dir' al-Watan base there for inspection visits. 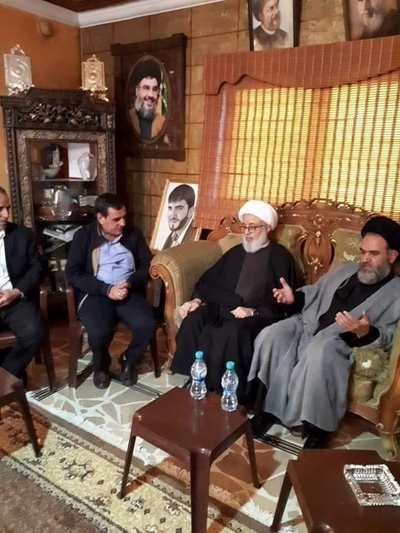 al-Hajj Muhammad Ja'afar with Sheikh Ali Jaber (a representative of Hezbollah leader Hassan Nasrallah) and Faysal Shaker, who is head of the reconciliation committee in the Beqaa and a cultural official for Hezbollah. They visited al-Hajj Muhammad Ja'afar as a delegation sent by Hassan Nasrallah. Q: Currently it seems that all the unofficial border crossings between the Homs countryside and the north Beqaa are closed. When were these crossings closed and what is the reason? A: The crossings you speak about are originally managed by the Syrian security apparatuses and there was humanitarian facilitation for these poor regions as there are 15 Syrian villages and most of their inhabitants have been Lebanese for decades and also there are Syrians from the Lebanese side though smaller in number. And these inhabitants were moving through these crossings on which more than one security apparatus from the Syrian side is present. 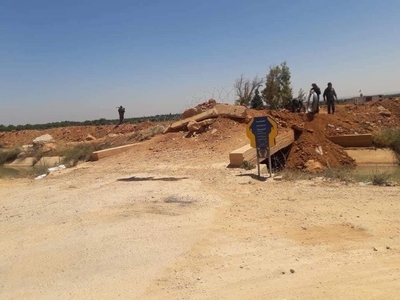 The new development this time is that a barricade of dirt has been erected, along with iron wires and the planting of mines from the Syrian side as well as the complete closing of the crossings. The reason is that there was media noise about the crossings, as well as smuggling that has no basis for it except harming the poor class that has been completely marginalised by the Lebanese state. Q: There was talk around a month ago that the 11th division of the Syrian Arab Army, accompanied by Russian military police, had come to the borders. What was the aim and is the 11th division present on the borders? A: Correct. Around a month ago a brigade of the 11th division deployed on these borders in addition to the apparatuses present previously and from the outset. And there is no presence for the Russian military police in these areas. Q: Is it true that the Russians asked the Islamic Resistance- Hezbollah to withdraw from the al-Qusayr area? Is it true that Hezbollah rejected the order? A: Firstly, the presence of Hezbollah in Syria was and remains coordinated with the Syrian leadership. And I do not think the Russians would make such a demand in the knowledge that there is a mutual understanding as well as coordination in more than one place between the Russians and Hezbollah. Second, Hezbollah is present in all the lands of Syria and entirely in coordination with the Syrian leadership. When its mission ends, naturally it will return to its homeland and it will have accomplished a great mission and it will be very content. Q: Did members of Dir' al-Watan have a role in these events? Can members of Dir' al-Watan from Lebanon still use the unofficial crossings? A: Members of Dir' al-Watan- the Special Force are from the inhabitants in the Syrian villages and those of them present in Lebanon come through the legal crossings with absolutely no obstruction in front of them. Q: So currently all the crossings in the Beqaa are under the administration of the Syrian army's 11th division, the resistance is still present, and the Russian military police withdrew. A: No presence for the Russian police on the borders. The 11th division with the previous security apparatuses. Q: Is there a plan to deploy the 11th division on all the borders between Syria and Lebanon? A: Until now I don't know, and as I see it, there is a mutual understanding on a regional and international level connected with decision 1701 concerning the borders. And the biggest role will be for Russia from the Syrian side. This is my view, not based on any political information. Q: Yes. Have you asked the Syrian government to open the crossings that you were speaking of? A: The matter must be rectified because there are farmers living within the Lebanese lands hundreds of metres away from their lands. Of course there is attention from the Syrian authorities. Q: What date did they close the crossings exactly? A: From the 3rd of this month they planted mines and iron wires. Q: Yes. So the decision to close the crossings came from the Syrian government because of pressure on it from the Lebanese state and media distortion. A: The Syrian state is not subject to any pressures, whatever their size, except when it is for the interest of the Syrian government. What happened from the media noise from the Lebanese side, the Lebanese authority will pay the price for it and we have begun to prepare ourselves to bring down the oppressive Lebanese regime: these rulers, who attained power over the blood of the Lebanese people, are the merchants of blood who have stolen all the needs of the Lebanese people and goaded lives in the name of religion, sectarianism and madhhabism. Q: Yes true, but of course the crossings were not closed without the agreement of the Syrian state. A: True. No one can do that except by decision from the Syrian government. Q: Yes. Do you expect that they will open the crossings in the near future? A: God willing, we will reach a mutual understanding to open a crossings and it will be supervised by all the security apparatuses to serve our people as they are from the inhabitants of these areas. Q: Yes. In your opinion why did the Russian military police come to the area around a month ago? Do you think the aim was to get the Islamic Resistance out of the area? A: There was a patrol on the borders and some of the Russian officers were present, but media noise that was out of place was taken up by some of the media. And nothing has changed regarding Hezbollah, because the matters are more than natural. Q: So the talk of a Russian plan to get Hezbollah out of the al-Qusayr area was media distortion? A: President Dr. Bashar Hafez al-Assad- may God protect him- has made declarations since the time of Qusayr and before that Sayyid Nasrallah- may the Lord protect him- regarding the Hezbollah presence and when it departs, it will be a united decision between Hezbollah and the Syrian leadership. And there is no sensitivity concerning this matter. Q: And according to what you have heard from the Russians, are their relations with Hezbollah very good? A: Very good, and most of the time there is coordination in the field of combat. Q: Some of the analysts say that Russia does not want to help the Syrian government in imposing its authority on all the lands of Syria, and that is is not trying to remove the Americans from Syria. What is your opinion on this talk? A: In the beginning of the Syrian crisis Russia was the political cover and defender of Syria in the UN Security Council, and Hezbollah had the greatest role in the fields of combat, and there were some Iranian experts. And in the most recent stage of the last three years approximately, Russia has intervened militarily and Russia still works in an effort to end the Syrian crisis. And God willing an end is near. And there was unconfirmed information that America asked for the withdrawal of Hezbollah and the IRGC in exchange for its withdrawal from Syria. In my view this decision goes back to the Syrian leadership and no one defines Syria's decision except the Syrian government led by the President Dr. Bashar Hafez al-Assad (may God protect him).